Situated on the Malwa Plateau on the eastern side of the River Shipra that originates from the Kakri Bardi Range in Indore district, Ujjain forms the eastern district of Madhya Pradesh, the heart-state of India. The district of Ujjain is surrounded by the districts of Shajapur in the north, Ratlam in the east, Dhar in the west, and Indore and Dewas in the south. 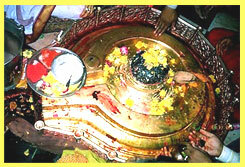 One of the seven sacred cities of the Hindus, known as Saptapurior Mokshapuri, Ujjain has been a prominent centre of religious activities for over 2,000 years. The township is particularly mentioned in the Atharva Veda, the last of the four Vedas(ancient Hindu texts written between 1,000 to 800 b.c.). Two parts of the Skanda Purana, another ancient holy text, are supposed to have been composed here. The district of Ujjain along with its surrounding regions, was ancient Avantikawith its capital at Ujjayini, which literally means the glorious conqueror. Apart from being a religious place, Ujjain tourism highlights the city as a centre for astronomy,developed by one of its rulers, Jai Singh. Ancient Hindu geographers fixed the centre of the Earth and the first meridian here to make astronomical calculations. 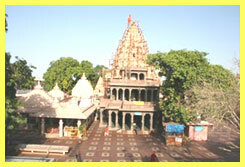 Mahakaleshwar temple The temple of Mahakaleshwara has high shikhara dominating the skyline and life of Ujjain. This temple is dedicated to Lord Shiva and the lingam at Mahakaleshwara is one of the 12 Jyotirlingas in India, it is believed to be swayambhu (born of itself). It is believed that it derives its shakti or power, from within itself. The south facing idol of this majestic shrine is one of its kind, a positioning upheld by tantric traditions and found only in Mahakaleshwara among the 12 Jyotirlingas. 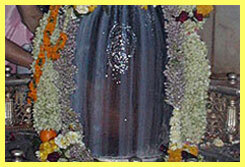 Every Mahashivaratri, in the month of March, a fair is held near the temple. This is a popular pilgramge spot situated above the tank near the Mahakaleshwar Temple and owns a large ornate statue of Ganesh. This temple is situated on the opposite bank of the River Shipra and is a considerable antiquity and a popular place of pilgrimage. The idol here is believed to be self formed. The artistically carved pillars of the assembly hall date back to the Parmara Periods. These caves are named after the great scholar poet Bhartihari, who lived and meditated here. These caves are situated on the banks of the river Shipra near Gadkalika Temple. This is an important shrine with the image of Goddess Annapurna. This is an observatory built by Maharaja Jai Singh between 1725 and 1730 AD. Ujjain is considered the Greenwich of India, with the first meridian of longitude passing through it. This observatory is smaller than those in Jaipur or Delhi but it's still in use and quite interesting. Astrologers can purchase the complete year's astronomical ephemeris in both English and Hindi at the observatory for Rs15 only. 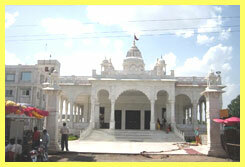 Apart from these attractions there are many more to see at Ujjain. There are many nearby tourist destinations also like Dewas, Agar, Nagda, Sailana, Maksi, Mandsaur, Gandhi Sagar and Bhanpura. 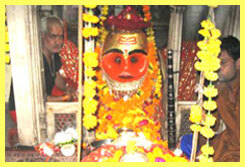 Festive occasions and fairs are an important part of the lives of people in Ujjain. An ancient religious centre, Ujjain is famous for the Kumbh Mela, a month-long fair attended by thousands of Hindu devotees. Locally known as Sinhast,the fair is held every 12 years, beginning on the full moon in the month of Chaitra (March-April) when Jupiter is in Scorpio and the Sun is in Aries. The Ardha Kumbh(half Kumbh) is held every six years. Legend has it that a kumbh (pot) containing nectar arose from the depths of the ocean because of a tug-of-war between the gods and the demons. The ocean was churned with the help of the snake Vasuki, and Mount Meru. A fight broke out between the gods and the demons over the pot of nectar. In the ensuing conflict, drops of nectar fell on the places that are now Prayag(Allahabad), Nasik, . The International Society of Krishna Consciousness (ISKCON), popularly known as the Hare Krishna Movement, was founded in 1966 by His Divine Grace A. C. Bhaktivedanta Swami Prabhupada. ISKCON is a worldwide association of devotees of Lord Krishna, the Supreme Personality of Godhead; its members consist of 10,000 temple devotees and 250,000 congregational devotees. Over four decades ISKCON has grown to comprise of over 350 temples, 60 rural communities, 50 schools and 60 restaurants. One of the main objectives of ISKCON is to promote the wellbeing of society by teaching the science of Krishna consciousness according to Bhagavad-Gita and other timeless Vedic scriptures. Bhairav is a fierce materialization of Lord Shiva, and the city of Ujjain has numerous shrines dedicated to this ferocious manifestation. Kal Bhairav temple is believed to be associated with the Tantra cult, a heretical secret religious group with brawny black magic nuances. The temple premises are mottled with holy men with ash smeared body and long matted hair. The Kal Bhairava Temple houses a Shiva linga under a banyan tree inside the periphery of the temple opposite to the statue of Nandi Bull. Kal Bhairav temple also depicts beautiful sculptures of other deities along with Lord Vishnu. On the eve of Mahasivarathri, the temple premises put on a festive mood when this shrine is packed with ardent devotees. 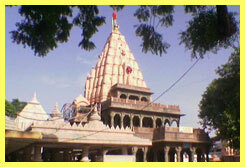 Dedicated to Lord Shiva, Mangalnath Temple is a greatly respected holy place situated in Ujjain. As per the inscriptions in Matsya Purana, Mangalnath is said to be the birthplace of Mars. Mangalnath Temple is placed on a serene surroundings and it overlooks the vast stretch of water in the majestic Shipra River.